Whether you are a student athlete, busy working professional or pro athlete, you are intimately familiar with the constant, demanding pace of life. When we try to do it all, something has to give, but don’t let it be your fueling agenda. Take a moment to review our Klean noshing-on-the-go tips to see if you are dotting all your i’s and crossing all your t’s. No matter where you are or what you’re doing, you need to eat like an elite. If you do, performance in all areas of your life will play out in a favorable fashion. This means planning ahead and eating nutrient-dense macros. All macros – whole grain carbs, lean proteins and healthy fats – should be represented at all meals and snacks. This will ensure that you obtain a balance of the more than 30 micros, vitamins and minerals that your body requires daily. Successful elite athletes do not eliminate food groups or “diet”; rather, they fuel their bodies like machines, so they function optimally and don’t break down. There’s no time for a trip to the body shop! Meet our newest product addition, Klean Hydration™ and learn the fundamentals of how to use one of an athlete’s most commonly used nutritional products. You’ve heard it many times before: Adequate fluid intake is critical for athletic performance and recovery. But like most athletes, you probably wonder whether your current hydration strategy is optimal. After all, your sense of thirst will not tell you unless you’re already dehydrated, and it’s hard to detect the signs of the initial fluid deficit. You train at high intensity and/or long durations increasing sweat rate and total volume lost, respectively. You work out indoors, or in warm and/or humid environments. In these conditions, heat cannot be dissipated easily due to lower evaporation of sweat from the skin. You train in cold environments. Cold air promotes respiratory fluid losses, and sweat rates are often high due to multiple layers of clothing and equipment. You are heavier than the average person. Generally, heavier athletes are more prone to dehydration. You live and/or are training at altitude. Above 8,200 feet, urine output increases. You also lose more water simply by breathing (respiratory water loss). Performing at your best- Swim, Bike, Run, FUEL. They say to perform well you must master the art of your sport. We have all heard it: the 10,000+ Hour rule, drills, dedication, and maybe a few good genes go a long way. But what about that athlete looking for that final 1%? In triathlon, they call this the 4th discipline: Nutrition. Regardless of the distance you’re running or the caliber of athlete you are, fueling for your training and races will make a difference in your racing abilities. That’s Just the Whey It Is! Optimizing protein intake is essential to keep your muscles strong and healthy.The recommended amounts range from 10-35% of the total daily calories, or anywhere from 0.5-1 gram of protein per pound of body weight per day, depending upon your body goals and fitness program. The demands of a rigorous training and travel schedule during a season – which can span up to 10 months of the year – can place both physical and mental strain on an athlete. With the pressure to maintain peak training, performance, health and well-being while logging countless training hours, many athletes turn to supplements to help nourish their bodies. There are many safe and effective supplement options available in the marketplace today, and as an informed, responsible athlete, you should never compromise on product quality or safety. So how do you know which supplements and nutritional products to trust? Through the NSF Certified for Sport® program, we work with brands and manufacturers to individually test each lot of product to ensure what’s in the bottle matches what’s on the label. As part of our meticulous testing process, we also screen every lot for more than 245 banned substances, based on the WADA list, that could potentially compromise an athlete’s career. This guarantees that when you see our seal, you know that you are consuming safer nutritional supplements and competing with the highest level of integrity and responsibility as an athlete. At any time, you can match your NSF Certified for Sport® supplement’s lot number to what appears on our website, to ensure the exact product you have has been tested and certified through the program. They invest in third-party testing processes to ensure the quality and purity of raw ingredients. They work with medical advisors, PhDs and registered dietitians to make sure the product is formulated based on science and safety. They conduct an annual review of labeling and marketing materials to ensure consistency with current standards. As a competitive athlete, I know first-hand that the day-to-day training for health and fitness demands significant time, energy and commitment, and is correspondingly rewarding when done with integrity. Make sure that you are properly fueling your body with food first, and when you need dietary supplements, choose nutritional products that come from certified and reliable brands. Whether you’re following an intense training schedule or have an event on the horizon, performance is on your mind. You train day after day, whether your body is ready to roll or fatigue is knocking on the door. Let’s face it: Some training days, your get-up-and-go has got up and left. These days can affect your physical, mental and emotional health, and, if they occur frequently, can contribute to overtraining syndrome and put personal bests out of reach. The key to keeping your training fresh, invigorating and effective is to invest in your recovery. For many athletes, “recovery” refers to rest and nutritional support after training and competition, but real recovery involves key strategies before, during and after exercise, as well as throughout the day. Essentially, athletes need to be in “recovery mode” at all times. The following is the second of a multi-part series on nutrition for strength and power athletes and finding the optimal recipe for peak performance. As all strength and power athletes know, muscles love dietary protein. The protein you eat provides the structural framework for muscle growth and development. It also allows your body to form antibodies to keep your immune system humming, enzymes to help you digest food and to support metabolic pathways that promote strength, and hormones that create an anabolic (“growth”) environment for your muscles. As we challenge our bodies physically, numerous physiological processes are accelerated in an attempt to meet the greater demands, and that requires the input of additional dietary protein. 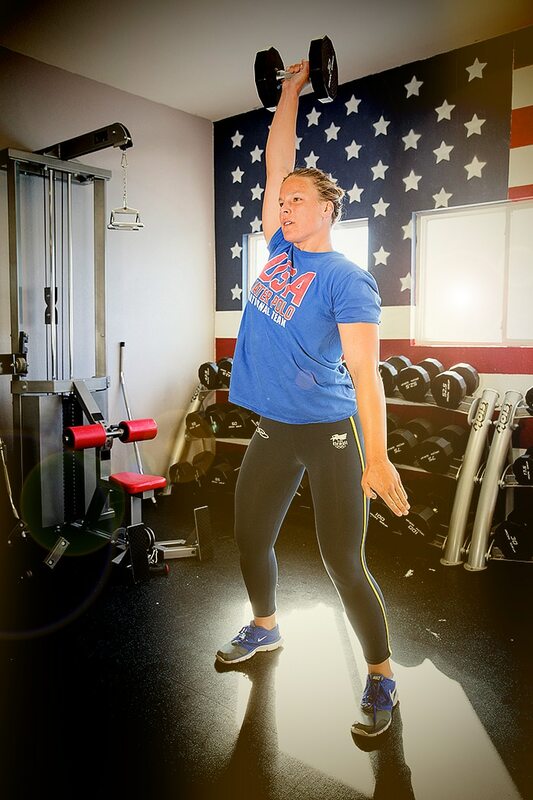 Kami Craig is a member of the Klean Athlete sponsored USA Water Polo Women’s Senior National Team, training at their facility in Orange County, CA. The following is the first of a multi-part series on nutrition for strength and power athletes and finding the optimal recipe for peak performance. It’s plain and simple: Strength and power athletes need more calories than their sedentary counterparts, but those needs vary tremendously depending on age, gender, body mass and sports-specific demands. Case in point: Maximal strength and power is a universal goal among weight lifters and gymnasts, but while weight lifters go all-out to gain body and muscle mass, gymnasts strive to limit unnecessary baggage so they can jump, flip and tumble. Determining your calorie needs is all about experimenting with current research-based sports nutrition guidelines so you can complete your own personal performance puzzle. Sleep, train, eat, work, repeat…. You follow a rigorous schedule making it critical to support each and every body part so you are game day after day, week after week… and you know the rest. Vitamin D, once primarily known for its intimate relationship with calcium to promote bone health, is now seen as a multitasking, super vitamin with many hypothesized benefits.‡ Actually, vitamin D is more than just a vitamin – it is a neuroregulatory steroid hormone that influences thousands of genes, and researchers have identified receptors all over the body.‡ Investigators are currently scrambling to shed light on vitamin D’s multitasking functions, especially since many Americans have suboptimal vitamin D levels. Let’s take a look at what we know now. Hint: Vitamin D may be an athletes best friend so don’t forget your daily dose of Klean-D!